CVE’s mission is to create employment opportunities for people with psychiatric disabilities and other underserved individuals through innovative practices and distinct choices. 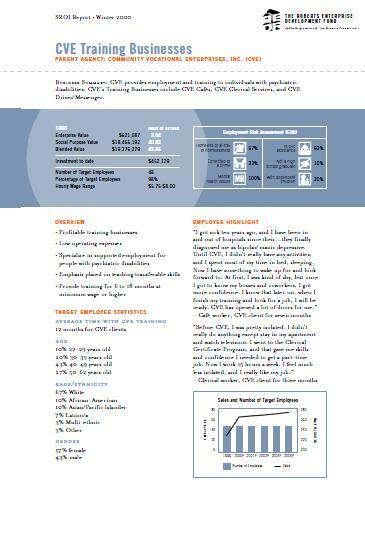 CVE provides employment and training to individuals with psychiatric disabilities. CVE’s Training Businesses include CVE Cafés, CVE Clerical Services, and CVE Driver/Messenger. 85% of respondents experienced a real increase in monthly income from work from their time of hire to their time of follow-up. The average amount of increase was $287. While 80% of respondents identified mental health as an employment barrier at baseline, only 44% identified this as a barrier at follow-up. 12% of respondents experienced an increase in the stability of their housing situation while 32% remained in a stable home and 48% stayed at risk for homelessness. Even though a majority of CVE employees continued to receive public assistance at both baseline and follow-up (primarily SSI), there is a very significant increase (46%) in the proportion of monthly income accounted for by work sources. On average, at baseline, work sources accounted for 5% of respondents’ total monthly income, as compared to 51% from work sources at follow-up. Because health insurance is so important to these CVE employees who have serious mental health diagnoses, it is important that 81% of respondents remained on Medi-Cal from baseline to follow-up and only 8% were un-insured at follow-up. From baseline to follow-up, 26% of respondents’ level of self-esteem increased. Satisfaction with cve programs 93% of CVE employees interviewed said they would recommend CVE programs to a friend or family member seeking vocational services.